Robert Bresson is, if anything even more revered now than in his cinematic heyday. Indeed, a super-quick way to get a cineaste slap is to criticise a Bresson movie, as I did with his 1977 The Devil, Probably / Le diable probablement, I film I continue to have issues with. But there are plenty of of other Bresson films that I'll enthusiastiucally champion (I adored his 1956 A Man Escaped / Un condamné à mort s'est échappé ou Le vent souffle où il veut) and a few have even achieved classic status, with his 1966 Au Hasard Balthazar coming in at number 16 in Sight & Sound's 2012 Greatest Films of All Time poll. Now two of his best loved films are to be released on UK DVD by Artificial Eye, the above-mentioned Au Hasard Balthazar and the 1967 Mouchette. 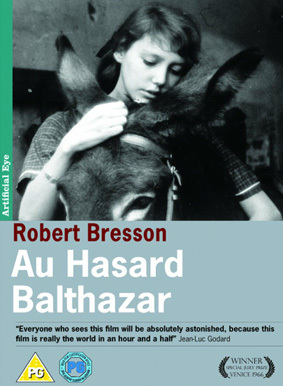 Bresson's celebrated masterpiece Au Hasard Balthazar is the seemingly simple yet profoundly moving and deeply affecting tale of Balthazar, a donkey in rural France. Passed from owner to owner, in turn treated kindly and cruelly, always inhabiting a world beyond his control, Balthazar exists as a beast of burden, suffering for the sins of man. But through his silence and powerlessness – as well as Bresson's masterly touch – his trajectory becomes a stirring, transcendental allegory of purity and hope. A film unlike any other, Au Hasard Balthazar was awarded the Special Jury Prize at the Venice Film Festival and has rightly taken its place in the pantheon of greatest French films ever made. 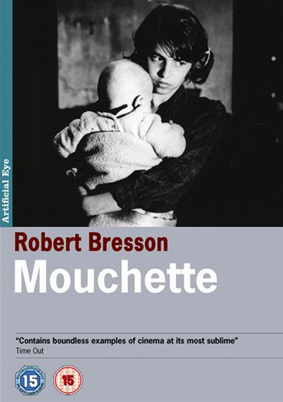 Mouchette is one of Robert Bresson's greatest cinematic achievements, plumbing immense emotional depths in one of the most searing, heartbreaking portraits of human frailty ever committed to celluloid. Hemmed in by a dying mother, an alcoholic father and a baby brother in need of care, the adolescent Mouchette searches for sanctuary in nature and domestic chores. As the delicate intricacies of her life are played out a touching, tender and tragic portrait is painted, making her of one of cinema's most memorable tragic heroines. An essential piece of classic French filmmaking. Au Hasard Balthazar and Mouchette will be released individually on UK DVD on 10th December 2012 by Artificial Eye at the RRP of £15.99. No extra features have been detailed for either disc.